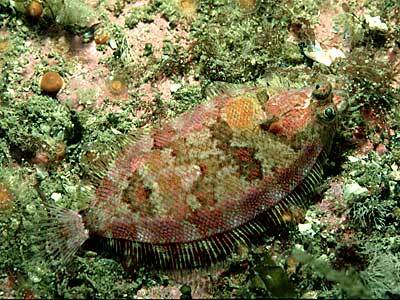 Description: The Norwegian topknot is a left-eyed flatfish that is oval in shape and more slender than other topknot species. It is also the smallest of the topknots, reaching a maximum length of 12cm. The background colour is usually brownish with irregular darker and also pink and orange blotches. Habitat: Like Zeugopterus punctatus this species lives amongst rocks in the shallow subtidal from 5m down to approximately 50m. Distribution: This species is mostly found on the Atlantic coasts of Britain and Ireland however it has also been recorded from the Calf of Man in the Irish Sea. Similar Species: This species is sometimes confused with the lemon sole (Microstomus kitt) however the latter is right-eyed. It is also similar to the topknot (Zeugopterus punctatus) and Bloch's topknot (Zeugopterus regius) but can be distinguished by its more slender appearance, smoother snout and relatively large scales. Picton, B.E. & Morrow, C.C. (2016). Phrynorhombus norvegicus (Gunther, 1862). [In] Encyclopedia of Marine Life of Britain and Ireland.